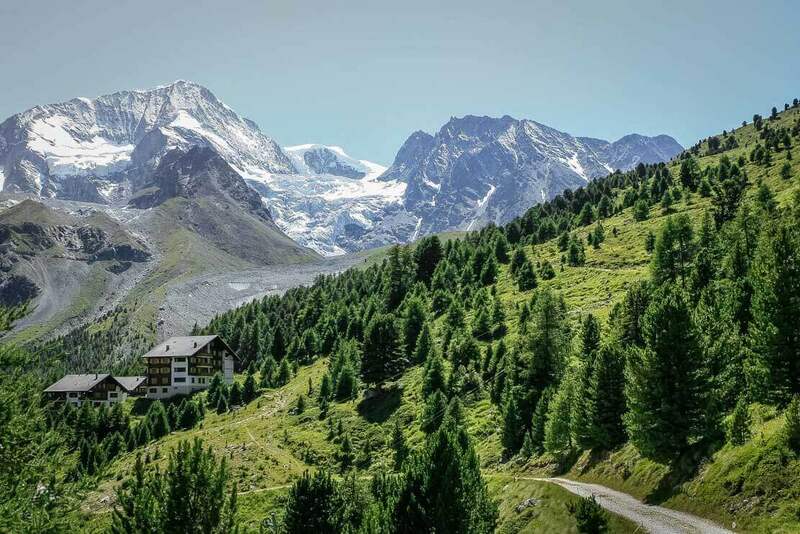 Combination of verdant and lunar landscapes accompanies the hiking trail to this picturesque mountain hut. 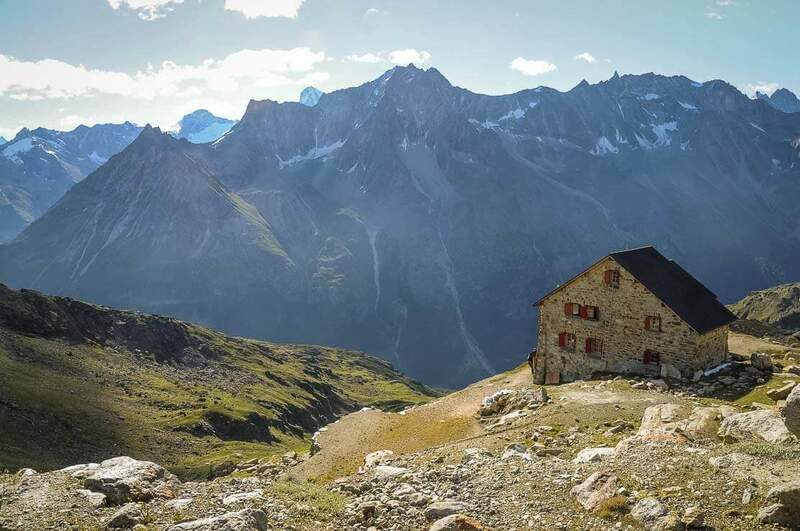 The hike to the Aiguilles Rouges Hut, with its spectacular alpine scenery, guarantees unforgettable memories. 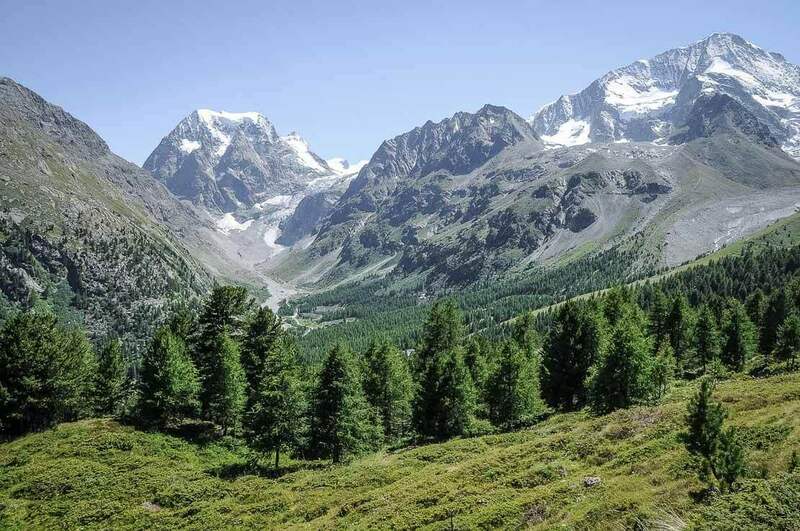 Planning to spend our weekend in the mountains, we leave Geneva for Arolla in Val d’Hérens in the canton of Wallis. 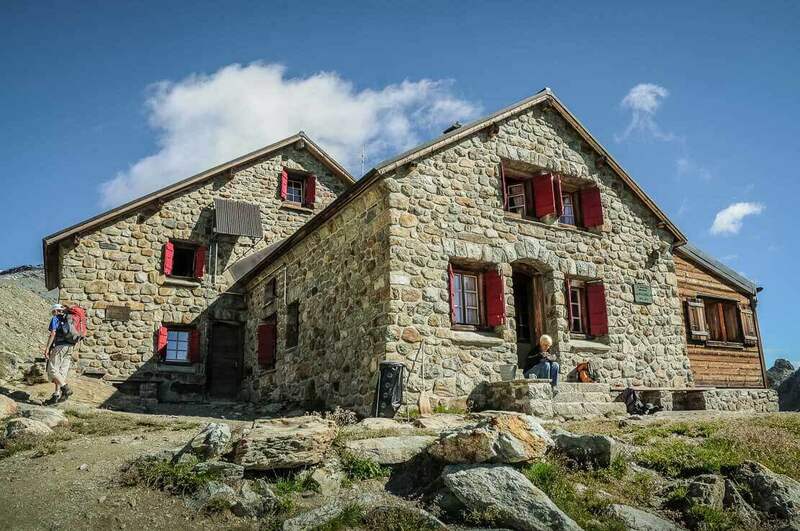 We will stay overnight in the Aiguilles Rouges hut. 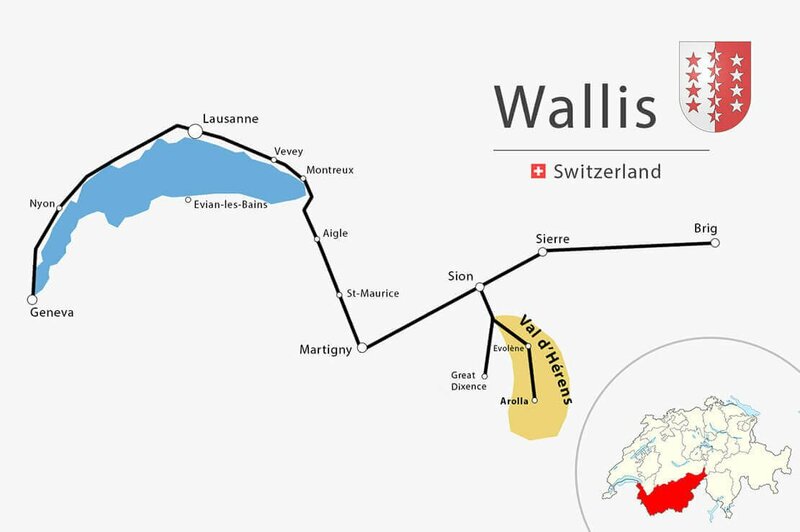 We drive to Val d’Hérens from the town of Sion. 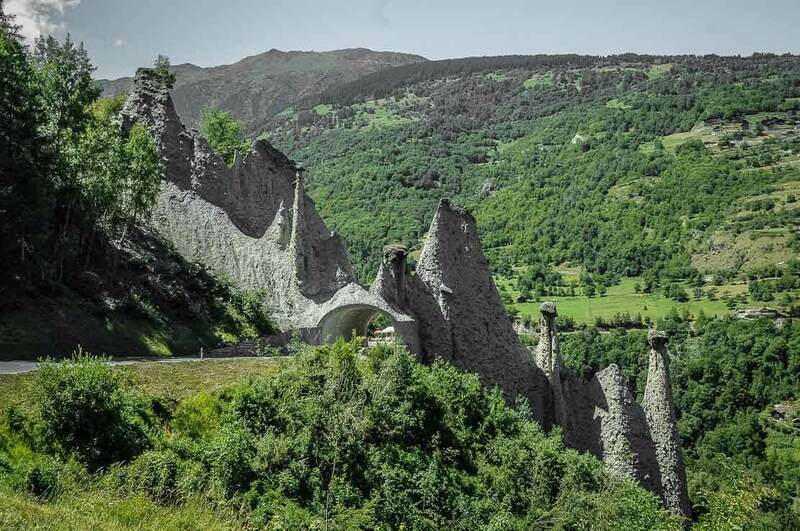 At the entrance of the small Wallis village of Euseigne, we come across the famous Euseigne Pyramids, a rock formation dating back to the Rhone glacier. 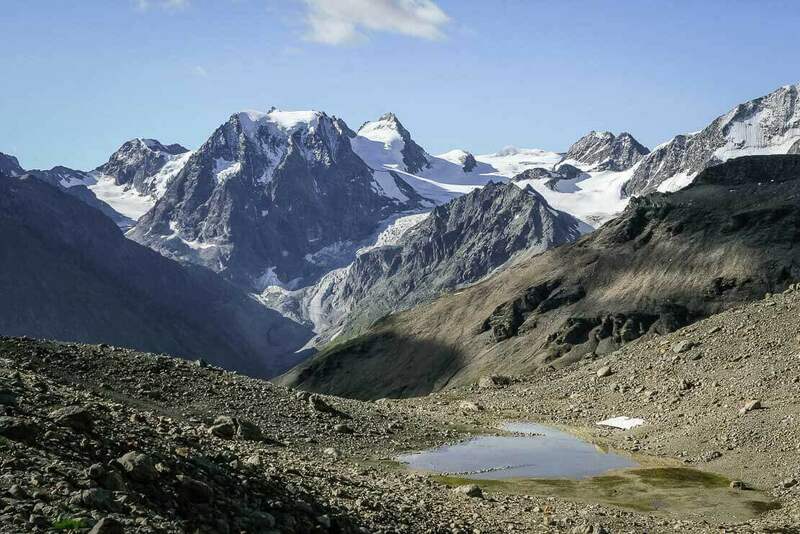 Over the years, both the melting of the glacier and the erosion have shaped this natural monument, a well-known site in Switzerland. If you have a closer look at some of these pyramids, you can notice a block of granite, which enabled to slow down the erosion creating these natural sculptures. 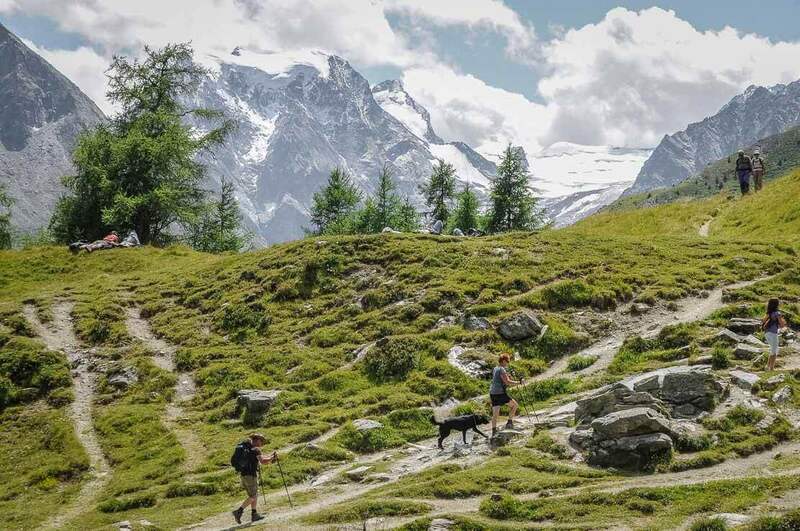 We cross the village of Arolla to arrive at the parking lot near the ski lift to leave the car and start our hike. 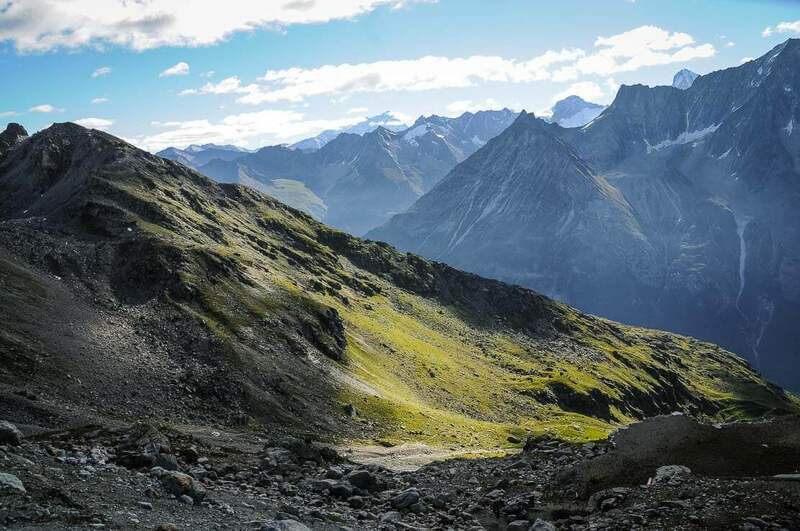 The first part of the hike is to reach the Pra Gra Remointse. The hiking trail up to Pra Gra is very easy, on a local rural road without any traffic. 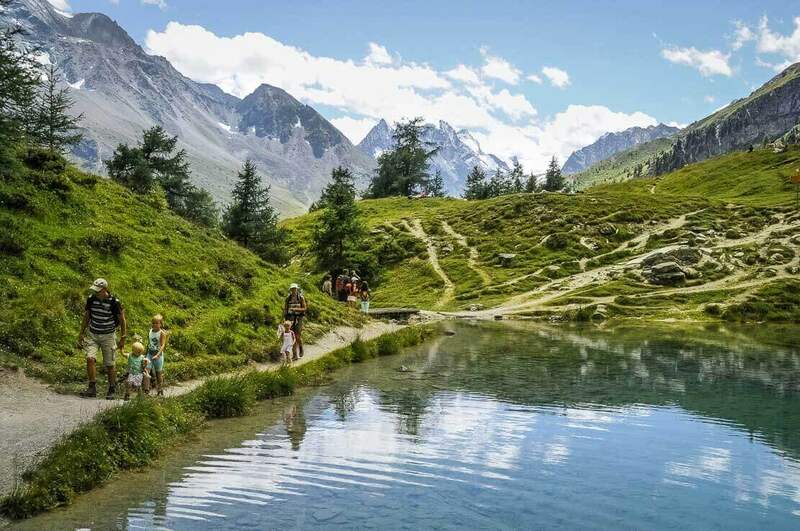 The trail continues through a forest and alpine pastures. 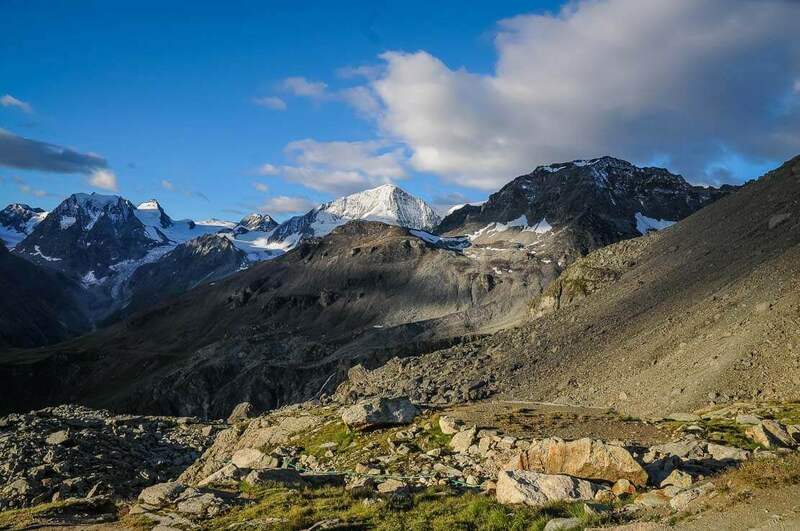 We reach the Pra Gra Remointse offering a panoramic view of the Pigne d’Arolla and Mount Collon. 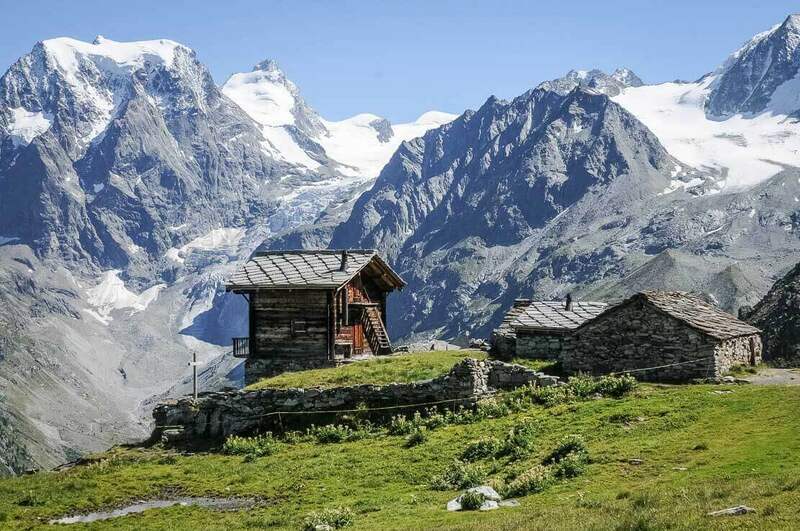 We come across old traditional houses and Hérens cows, the cow race typical for this valley and known for its combative spirit. 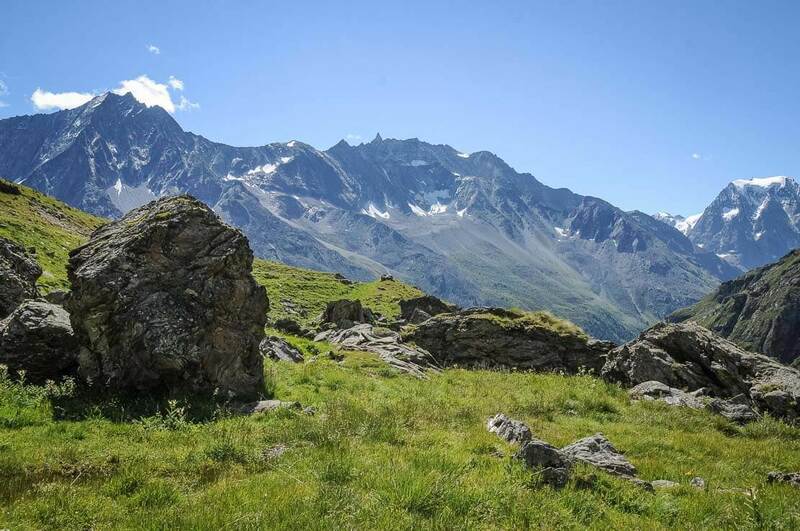 The queen fighting regularly takes place in Val d’Hérens, and the cows are the subject of the breeders’ pride. 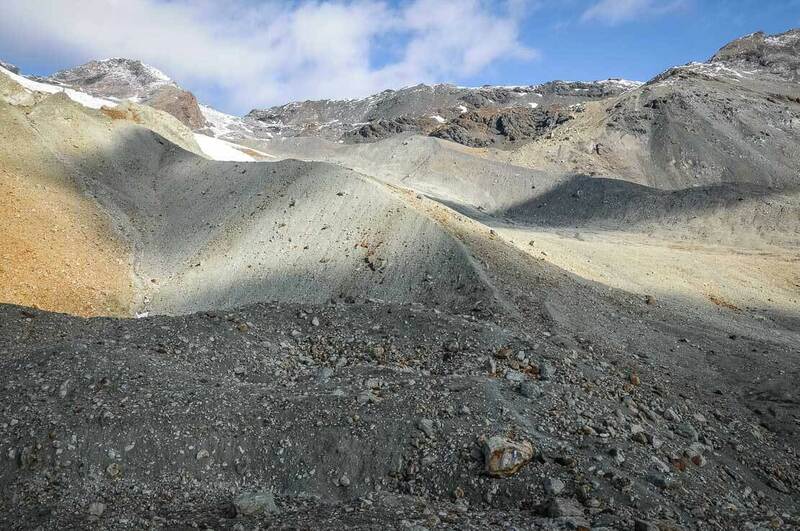 After having left the green pastures of Pra Gra, we enter a rocky and lunar world. 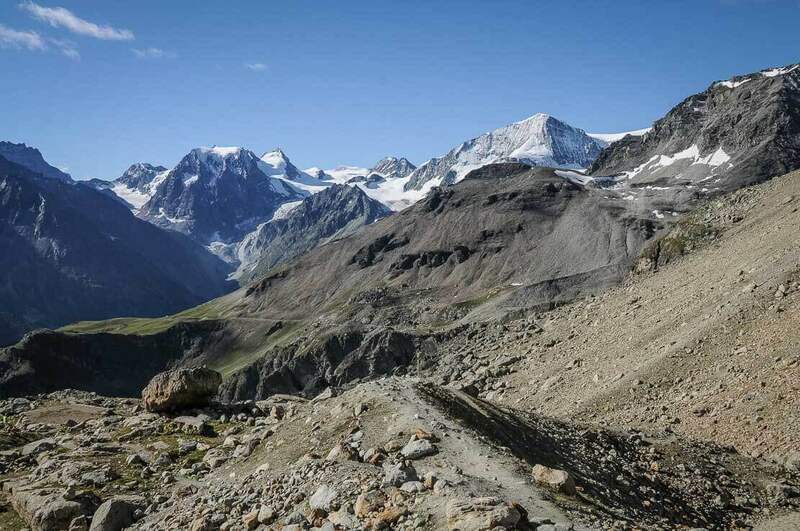 The hiking trail goes through the area, where the glacier was a king a few decades ago. Now it’s no more than a rocky formation. 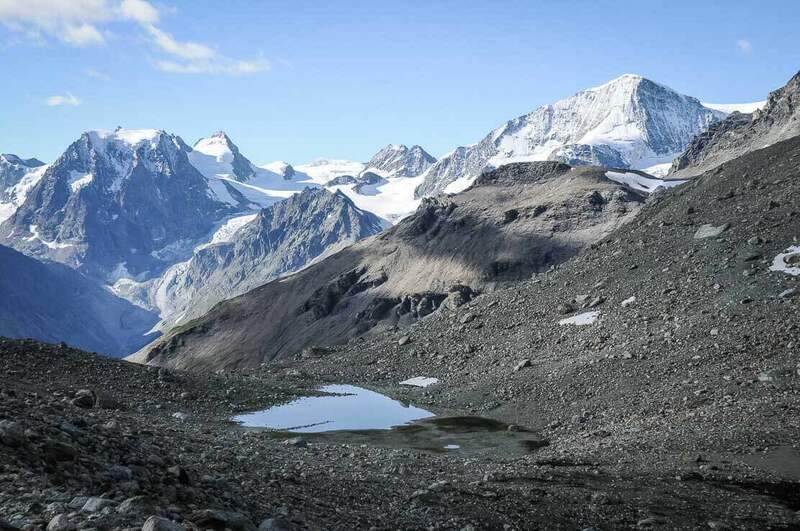 A bit of glacier still exists but you have to look for it on higher grounds. 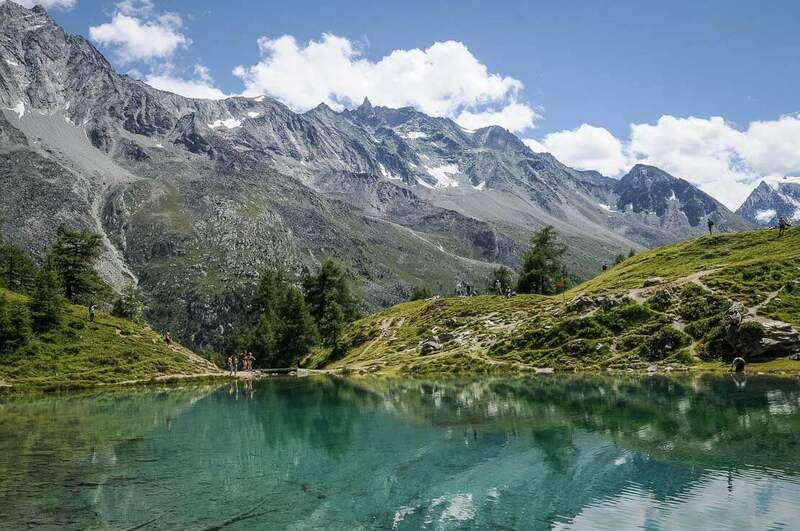 We cross the torrent, and at the bottom, we see the turquoise waters of the little Lac Bleu, or Blue Lake. 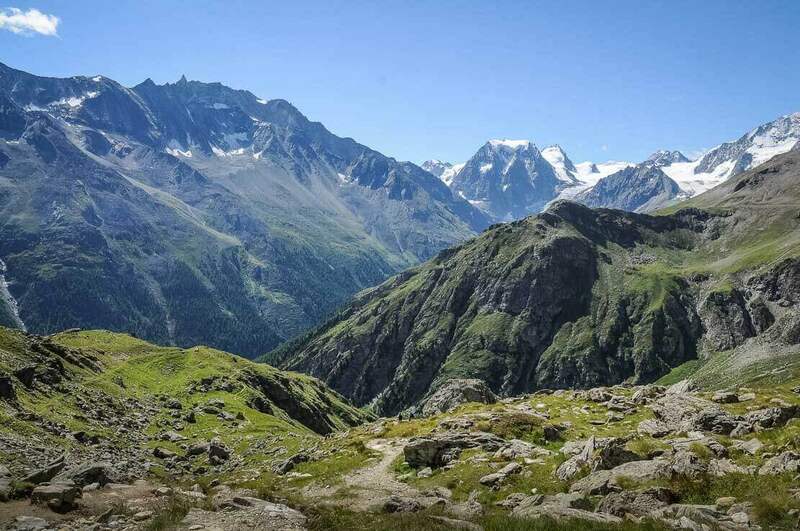 The Aiguilles Rouges hut is visible from the distance. 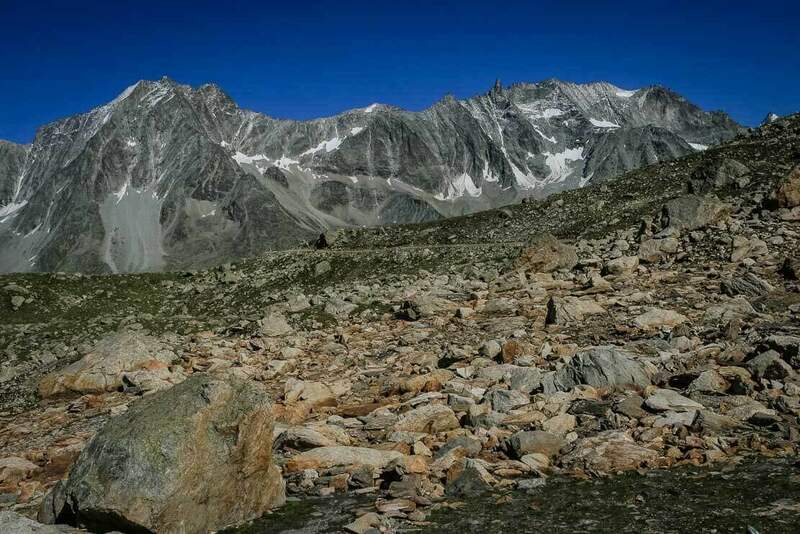 But first we have to cross over large boulders that the mountain has set across the way. The signs painted in red on these large boulders indicate the hiking trail to follow, very useful in this labyrinth of rocks. A passage, exposed and secured by chains, lies head of us. 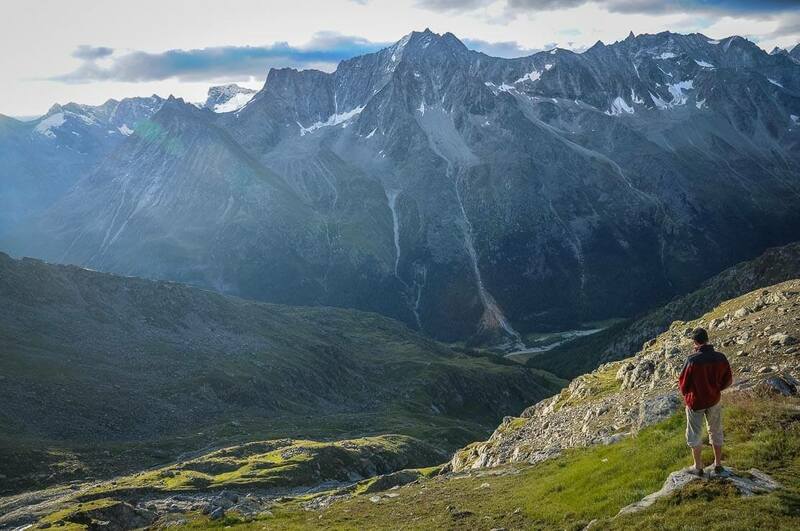 We ascend the valley, our final climb before reaching the Aiguilles Rouges hut. Once arrived and checked in our dormitory, we enjoy a well-deserved dinner. 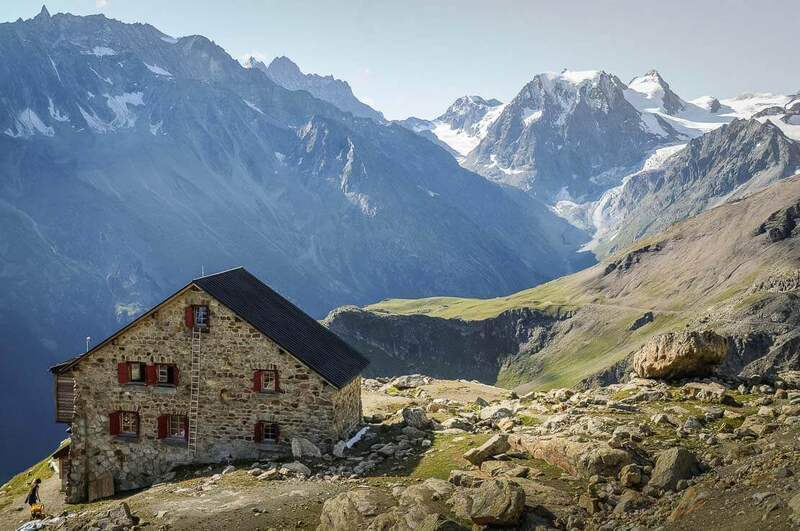 Located on the right side of Arolla valley in Val d’Hérens, at 2,821m altitude, the Aiguilles Rouges hut, made of stones, is very picturesque. Built in 1948, it has been upgraded in 1975 and 1991. In the morning we get up early to start our descent taking a different hiking trail. Making a loop circuit is psychologically more enjoyable than returning by the same road. 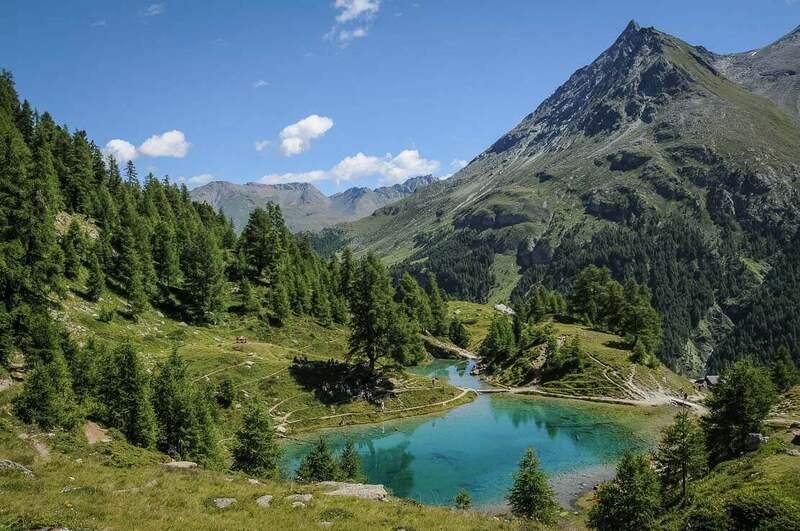 We can see the Lac Bleu, or Blue Lake, below but we also notice that the way down is much steeper. 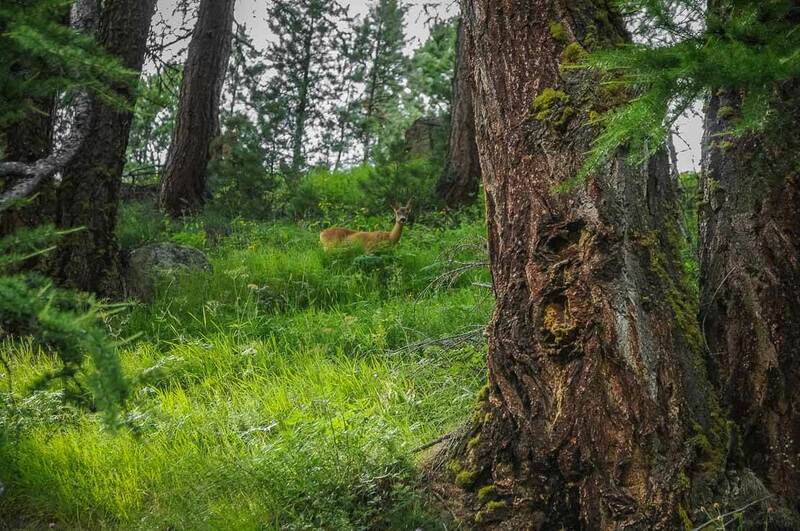 The descent is spectacular but the trail requires some attention. 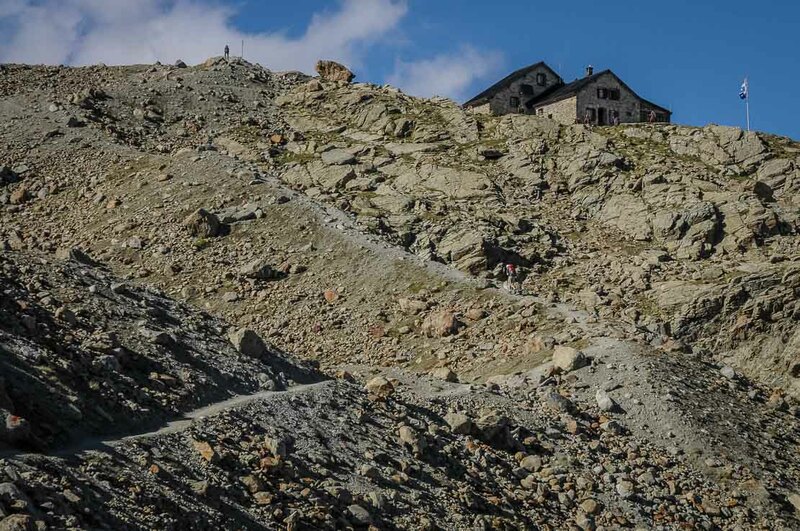 It’s irregular, steep and sometimes narrow, especially when getting closer to the lake. The Blue Lake is incredibly beautiful. Its turquoise colour is almost unreal. It’s hot, especially after such a descent. Errol and our friend decide to go for a swim. Despite the heat, the water is freezing! 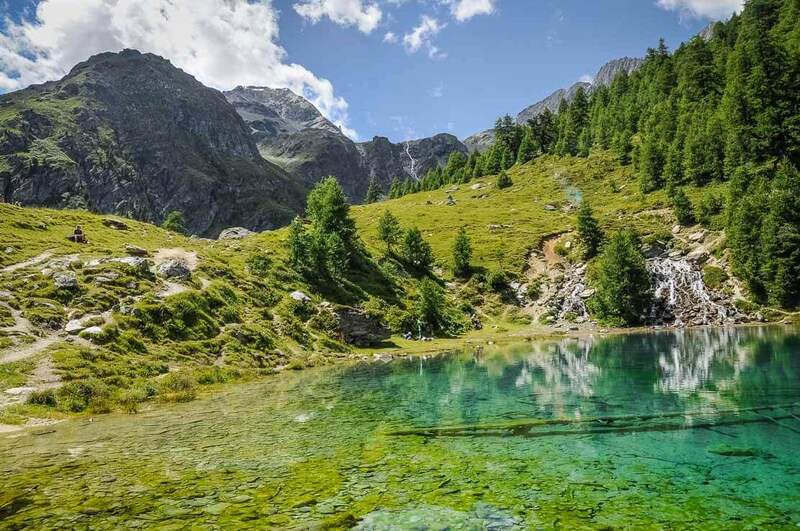 This small Blue Lake is quite popular as it’s easily accessible by walking from Satarma or La Goutte. 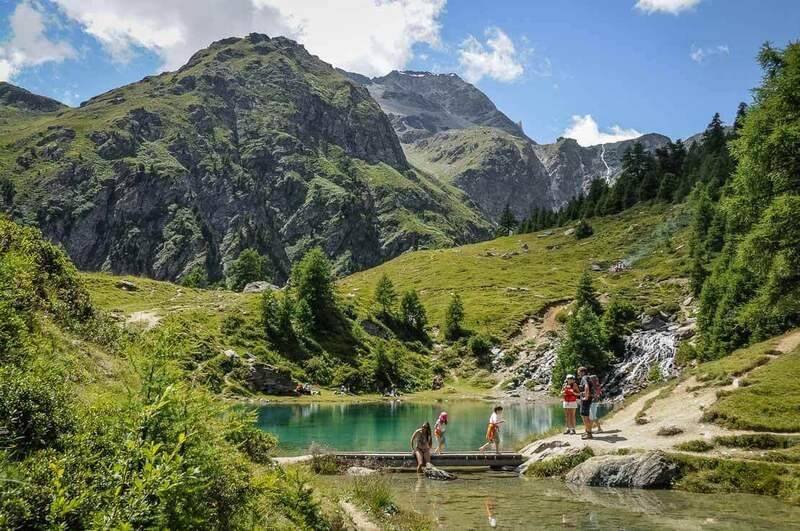 Once the swimming is finished, we have the choice to continue the road and take a bus or take the hiking trail that connects the Blue Lake to Arolla. We decide to walk. 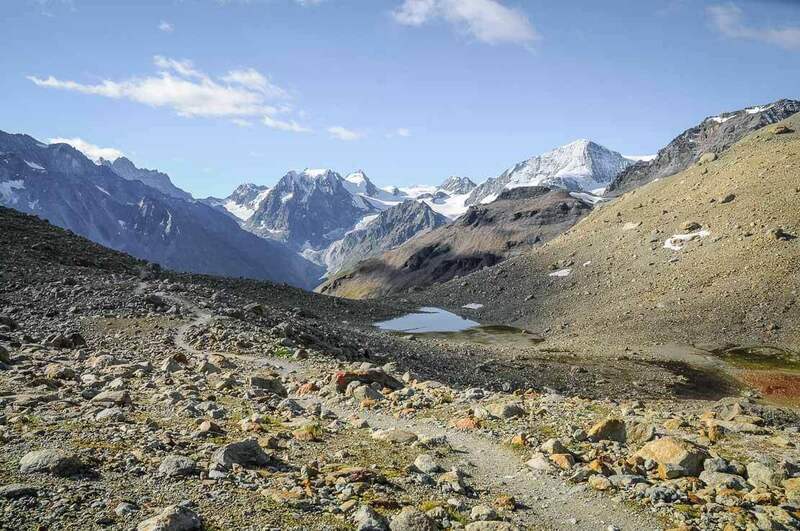 On the way from Lac Bleu to Arolla, a steep descent awaits us. We cross the torrent by the bridge and start a steep ascent before following the trail in a forest below the cliffs. There is a passage with chains – if it rains, you have to be extra careful, it’s slippery. 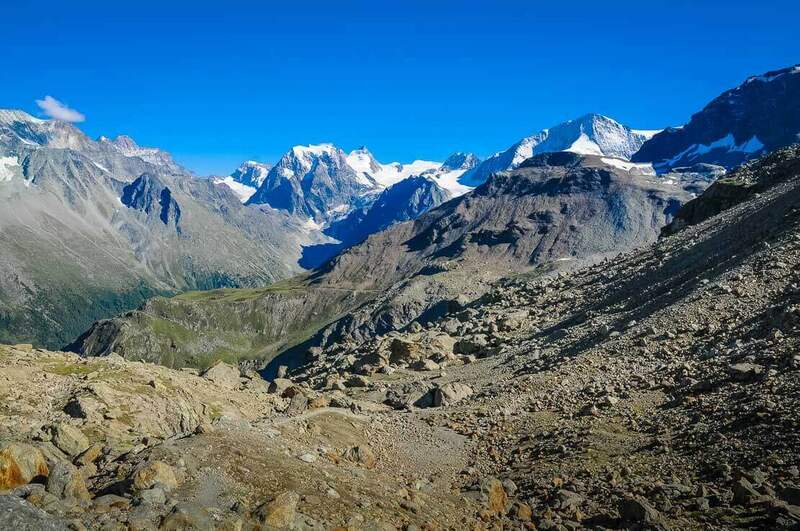 We finally arrive at the starting point in Arolla, very pleased to having done this beautiful hike to the Aiguilles Rouges hut. 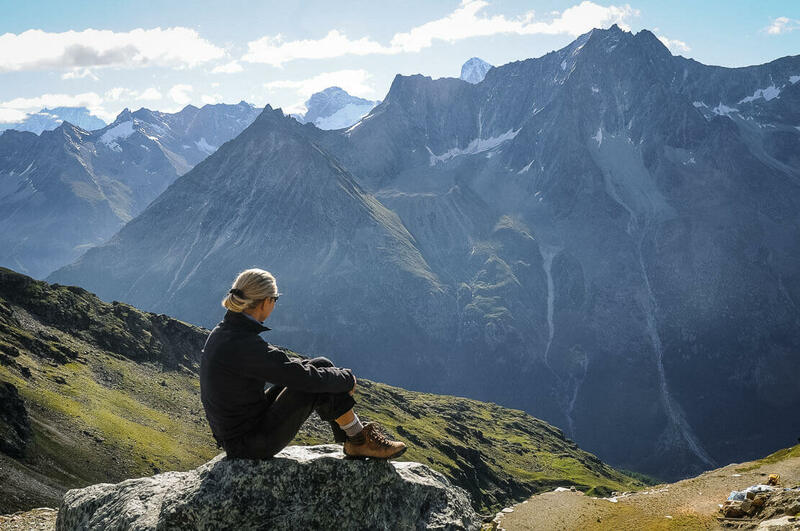 A beautiful effort in a fantastic alpine décor, with sumptuous landscapes that will remain in our memory. 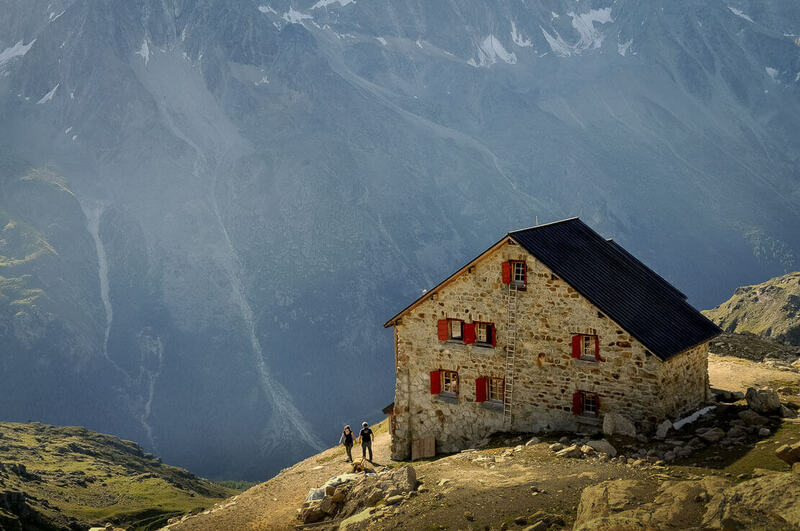 Access: The Aiguilles Rouges Hut is located in the canton of Wallis in Switzerland, at 2,821m, in Val d’Hérens. 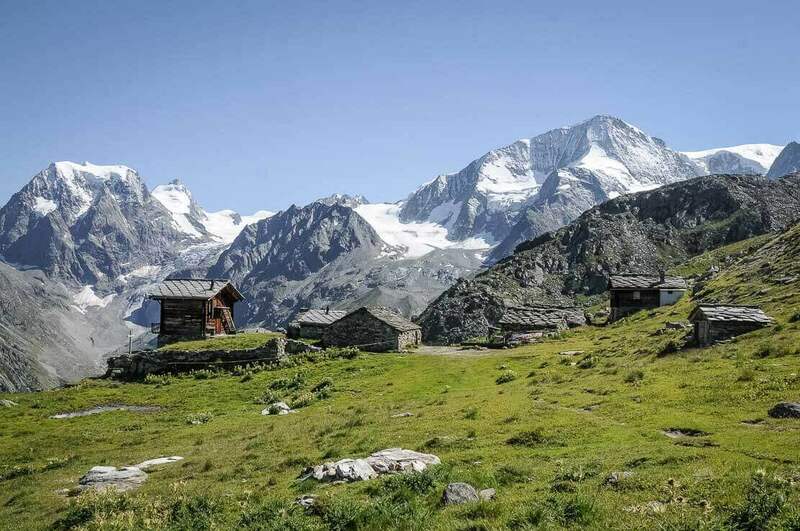 It’s accessible from the parking lot near the ski lift in the village of Arolla. 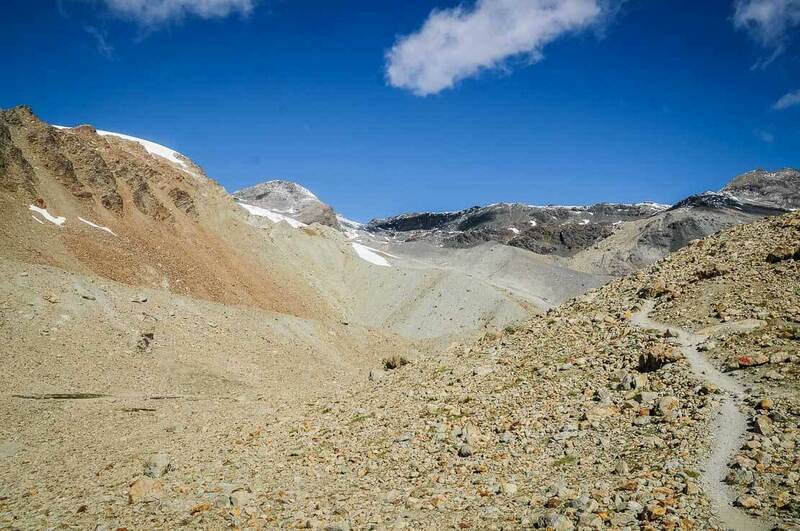 Duration: 2h30 to 3h of walk for the ascent. The descent by the Blue Lake is about 5 hours. 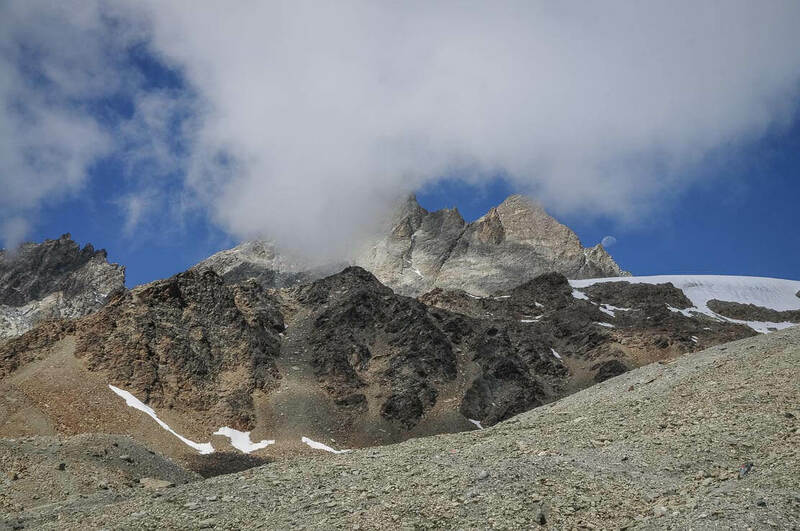 Difficulty: Easy hike despite its classification as T3 (demanding mountain hiking), 12 km, with 800m altitude difference. 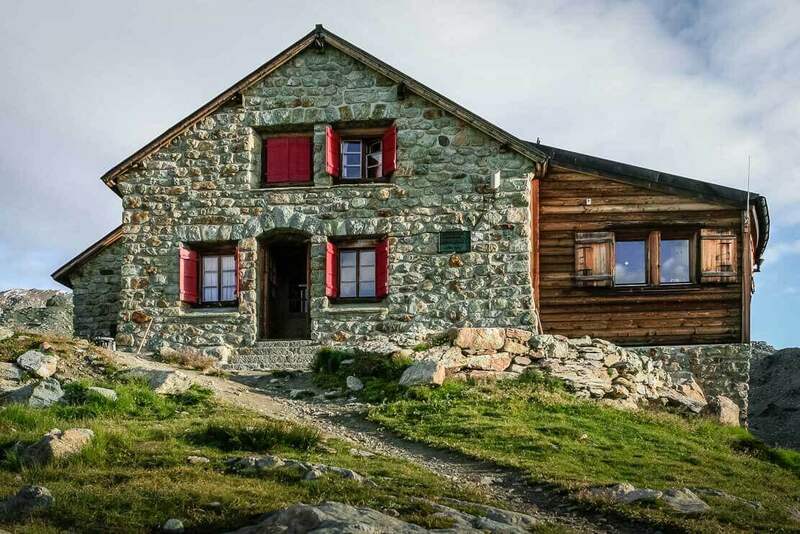 Aiguilles Rouges Hut is open all year round but guarded only from mid-March to mid-April and from late June to late September. 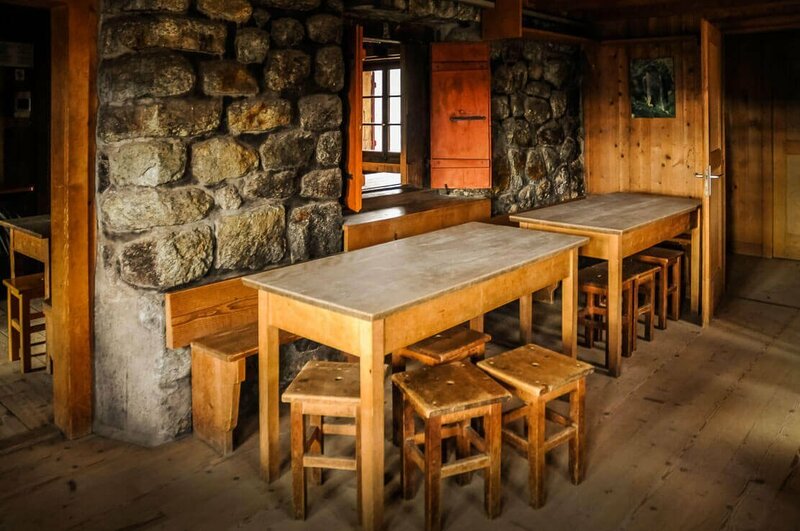 Drinks, simple meals and half-board available when the hut is guarded. Possibility of cooking in the absence of the guard. 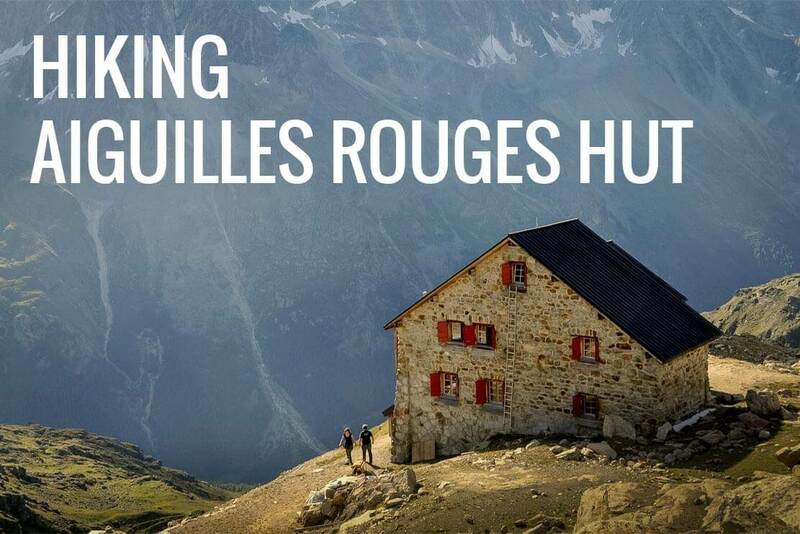 The hut is managed by the Association of the Aiguilles Rouges Hut.